We tried selling bulbs for N. jonquil “Early Louisiana” and my introduction ‘Suzy Q’ though Mitch Carney and South Mountain Flower Farm and Mitch says too few or no takers. 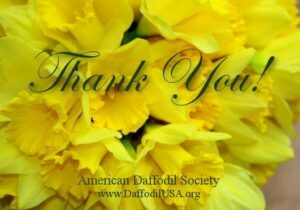 If there is a daffodil society out there that would like some bulbs and can offer a few bulbs or an exchange that I can give to my Daffodil Society’ bulb exchange here, please lets make an exchange. I don’t like to just give them away because Mitch is trying to sell them, however, something for something. I forgot how to spell the classic quote for that. The name N. jonquil “early Louisiana” is not accepted by some but it is a much earlier version of the N. jonquil that is usually very late, however, N. rupicola “Oregon Strain” is still N. rupicola. So you show it as N. jonquil. My original bulbs came from Keith down in Texas. “Suzy Q’ 10Y-Y is a vigorous little miniature where one bulb will make a clump in two years. It is also very show worthy and I’ve used it many times in blue ribbon collections as well as miniature rose ribbons before it was named and in 2015 VDS Show in Richmond it won the mini Gold Ribbon. I must admit the win in Richmond looked different than the ones on daffseek. It’s a cross with N. fernandesii and I think a touch of the N. jonquilla was showing as sometimes happens with crosses (variable). If I read Naomi’s email correctly it is now on the miniature list. I do not plan on replanting any of these two bulbs as I have too many of them already and I have to cut back. Bulbocodiums, jonquils and tazetta grow in my soil and climate like weeds in most people’s gardens. The compost heap! Please send them both! Used to have lots of Early Louisiana when I lived in Carmel Valley but not many of that one now if any. Got them from a Mrs Wheless in Sibley Louisiana. She was an old farm lady who sold them for pennies in the old Louisiana Farm Market Bulletin. Thanks everyone. The bulbs now have good homes. Bill, I also got your request and will send them to you. A couple of your new Spring blooming introductions would be great.